The simulation settings window allows you to control how ModelRisk will run a simulation. It is accessed by clicking on the ModelRisk ribbon. The window has three tabs: Model Settings, which controls the running of the specific model; Macro Settings, which allows one to run macros before and/or after each simulation and/or model sample; and Application Settings which defines the default settings for a number of ModelRisk parameters. Simulation names optionally allows you to give a name to each simulation for easier identification. Either enter a list of names, e.g. or refer to a spreadsheet range which will copy the list in for you. If used, the name will appear in the Simulation # drop-down control in the Simulation Results window. Stop on output error is a useful feature to debug your model. ModelRisk will stop simulating and show the scenario that produced the error. Show results window at end of simulation will automatically pop up the Simulation Results window once ModelRisk has completed a simulation. This should normally be switched on, but you may want to deselect this option if, for example, you are only interested in the mean simulation result displayed by using VoseSimMean. Seed values are used to control how ModelRisk generates random samples for its stochastic variables. They are particularly useful if you wish to reproduce a set of simulation results. Use different seeds – All must be defined: seed values for each simulation will use the list specified in the Seed Value(s) field. This can be useful if you wish to check the effect of using different seed values on your model, but is not commonly used. 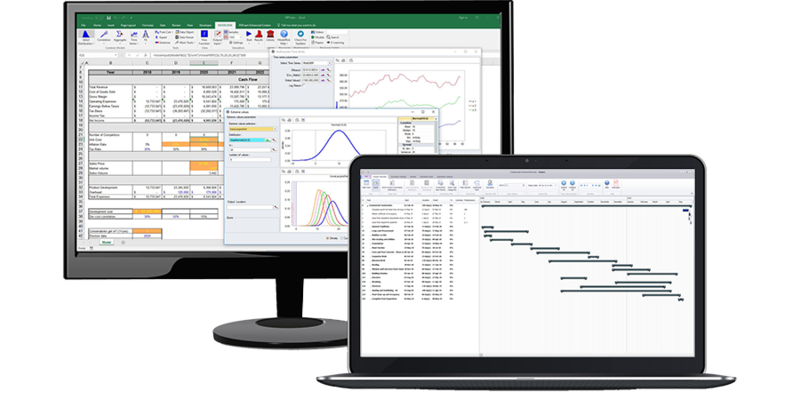 Switching ON the Go To Sample feature will allow the user to load any simulation sample into the spreadsheet after the simulation has been performed. Switching this feature on might increase the simulation start time, and if this feature is not required, the user can switch it off to speed up the simulation. If the feature if turned on, the Go To Sample functionality becomes available in the Data list view of the Results Viewer window. You can save simulation settings, and load previously saved settings. The simulation settings file takes a .vmro extension. Application settings control some basic ModelRisk default actions. Remove Vose Software details from reports will produce reports from the Results Viewer without any acknowledgment of the software used. Save Results determines whether, when one saves a spreadsheet model for which a simulation has been performed, ModelRisk will prompt the user to save a simulation results file or do it automatically. Samples is the default number of samples that would be used for any newly created model. The default number of samples is easily over-ridden by typing a different number in the ModelRisk ribbon, or in the Model Settings window. Stop on output error determines the default setting, which can be over-ridden for an individual model run in the Model Settings window. Show results window at end of simulation determines whether up the Simulation Results window will automatically pop once ModelRisk has completed a simulation. The setting can be over-ridden for an individual model run in the Model Settings window. The Global timeout sets the maximum number of seconds for any ModelRisk function to calculate its value. It's useful when one uses calculation-intensive functions and enters parameters that result in a very long calculation loop. Histogram Bars determines how many bars there will be in a histogram plot of simulation results. The Auto option will select the number of bars according to Sturges' rule to reflect the level of detail implied by the number of samples taken in a simulation run. The number of bars can still be changed for individual histogram plots in the Simulation Results window. Histogram View determines whether the default plotting of histograms should be bars or lines. This can still be changed for individual histogram plots in the Simulation Results window. It is more common to use bars, but lines are better if you habitually plot several variables in the same histogram plot. Histogram sliders determines the default location for sliders in terms of cumulative probabilities. This can still be changed for individual histogram plots in the Simulation Results window. Box-plot percentiles determines the default percentiles plotted around the 50th percentile for box-plots. This can still be changed for individual histogram plots in the Simulation Results window. Trend-plot percentiles determines the default percentiles plotted around the 50th percentile or mean for trend plots. This can still be changed for individual trend plots in the Simulation Results window. Allow the user to set the location of the files created by the ModelRisk Library (Industrial edition only).